If you see Elvis and us, please honk and wave. The next post will be from Michigan ... next week. Click on the "Cottage" album in the sidebar if you'd like to see more. I looooove scraps! My eyes see a world of potential in each piece ... whether it's the tiniest bit trimmed from a seam, a cut off selvage, or the excess from an over-sized quilt or block. Mine and those "gifted" from friends are readily waiting for use in both of my studios. There's enough that I don't need to haul any back and forth between Michigan and Tennessee. 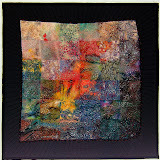 Here are five quilts representative of the way I use these scraps in quilts and fiber art. This is the second piece made back at the beginning of my adventure into the world of quilting ... back when I had declared my intention to use only scraps and re-purposed fabric for my quilts. It makes me smile when I remember the surprised look on faces at that statement. How naive, though well intentioned, I was then. There's NO way to resist buying fabrics when I go into a shop ... and it certainly didn't take long for my tune to change. Both studios have more yardage than I'll ever use in my lifetime. Now I resist going into the fabric shops to keep from adding to those stashes. Go here to read more about this quilt. This is the third quilt I made in the fifteen years that I've been quilting. There are silk and wool fabric samples along with cotton ones in this. 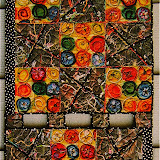 The centers of the squares were made from an old batik blouse given to me by a friend. The sashing and borders are made with purchased yardage. Go here to read more about it. Every once in while between projects I make up blocks such as this from my scrap bags. It's the method of sewing small pieces to a long strip (usually cuttoffs from an oversized quilt), cutting those apart then sewing those to another long strip. This is repeated until I can cut an 8" block. Of course, the trimmings go back into the bag or onto the edge of another block to make big enough. By the time there are a dozen or so blocks finished I can't resist playing with them and they end up being "something". Most usually a cuddle quilt for a sick child. Go here to read the special story behing this one. Four of those blocks ended up becoming one of my "Crinkle" quilts. Go here to read about the finishing and mounting of this art piece which is the first of four in a series. Each piece is made from the trimmings from the previous one. 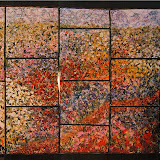 The photo below is the first step for the second piece, "Squared Off". Four more of those scrap blocks were pieced together. 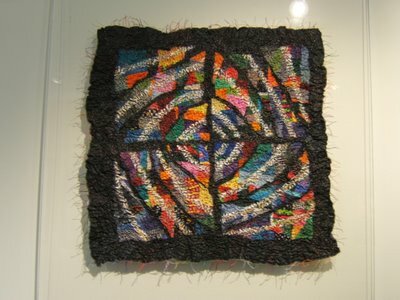 The black fabric that had been trimmed from from behind the scrap blocks in "Circle 'round" were appliqued on top. 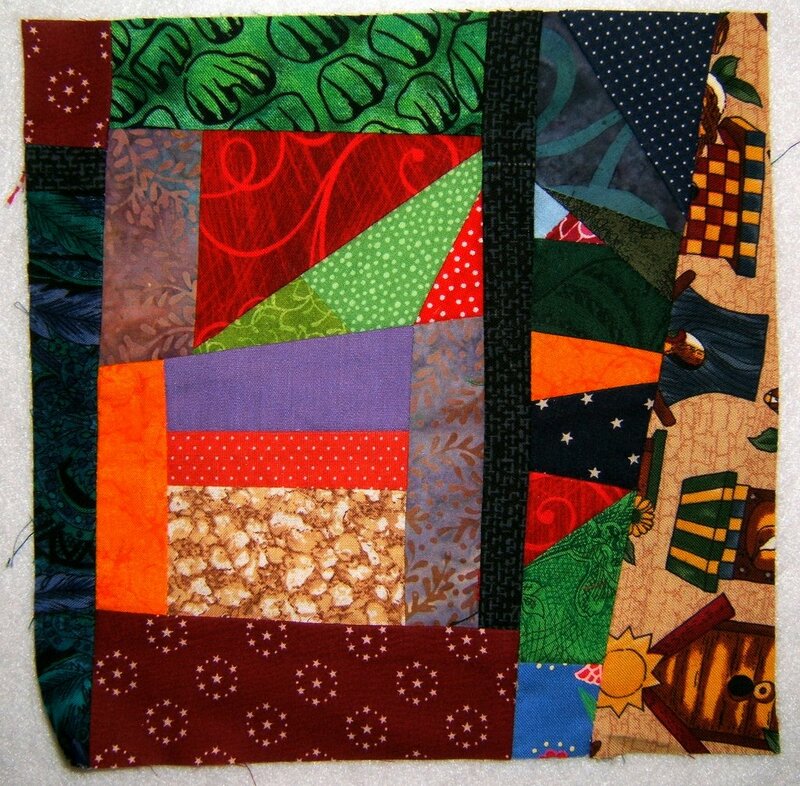 The fabric from this set of scrap blocks was trimmed away behind the black pieces ... they were the beginning of the third piece in this series which I'm still quilting. Number four made with the trimmed away pieces from #3 is also being worked on. They're my hand work pieces for when I go to Bee, travel, or am watching TV. Be sure to visit Michele of With Heart and Hands. 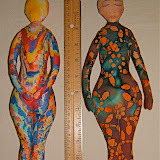 It is she who has sparked my posting about the scrap quilts I've made. You'll find links to other blogs that are also featuring scrap(y) quilts for an online show this Memorial weekend. 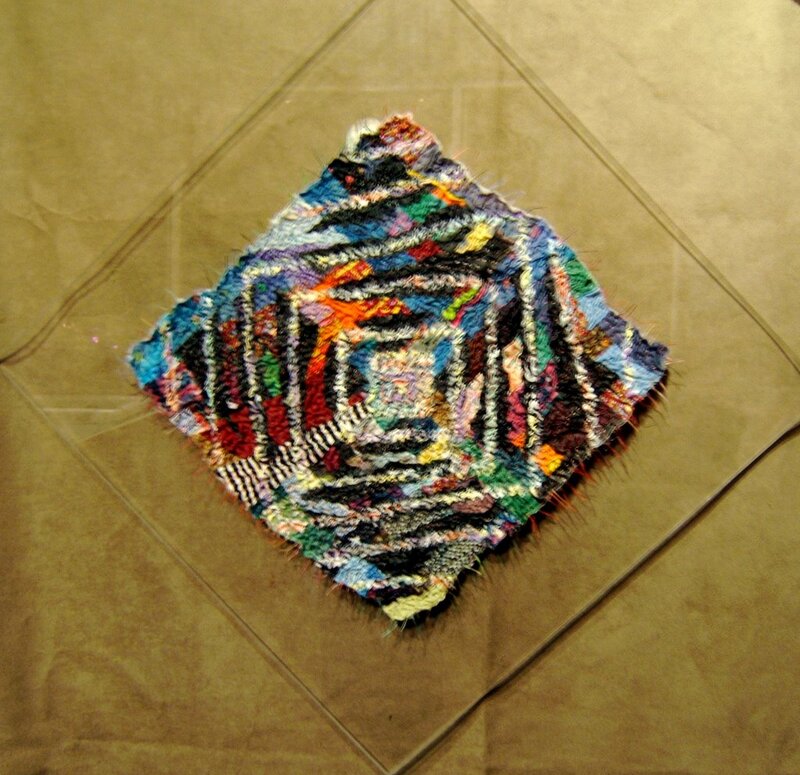 For years I've been making art quilts with a collage technique I call "ortwork" ... a play on the words artwork and ort which is the British term for scraps. I look at all of these bits and pieces and see potential "brush strokes". For the last month this has been the sole source of material for a major project that will be ongoing for quite a few months ahead. There have been hints of this project in previous posts. It's being revealed today in response to a campaign by Michele of With Heart and Hands for her readers to feature scrap quilts, or "quilts made with everything but the kitchen sink". During this past month of work I've created the first layer, the one I call under painting for a large ... no make that HUGE ... commission project. This schematic represents an installation of twenty-five separate panels that all together measures 14 feet wide and 10 feet high. My older son designed a grid template on Photoshop for me to drop a photo of each piece into place as it's completed. I am so thankful for this invaluable design tool. Without it, there would be no way for me to see all these panels together and how they interact as a whole piece. Otherwise, the only time I'd ever see them in their proper orientation would be when it's finished and installed on the wall of a lobby. Here's a close-up of one panel that measures 24"x 34". 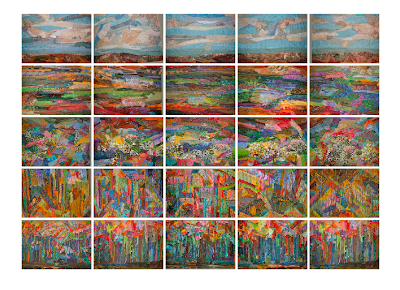 It, plus the other 24 panels, are packed up along with supplies ready to be transported to Studio North next week. There I'll build another layer(s) that will transform them into a large field of prairie flowers under a summer sky. I'll post my progress throughout the summer. PS: For an occasional break I may whip up a lake quilt from the heap of scraps. I haven't made one of those since #68 last fall in Studio North. Stack-n-Whack quilts intrigue me as do kaleidoscopes. I almost missed recognizing this quilt as one. It was made by Sue McCoy of Knoxville, Tennessee. As far as I can figure out this is a border print and Sue used it as such on the outside edge of the quilt. That green cord inserted between the binding and border is a nice touch. The print of this fabric made wonderfully subtle patterns. This lopsided photo is of the quilt made by our guild. Raffle tickets were sold before and during the show to raise money for our service projects ... the biggest one being quilts for children at Knoxville's Ronald McDonald house. I had donated the three stack-n-whacks at the center bottom of the quilt. Loretta Painter donated the topiary tree block that I had made for her from a s&w block in an exchange. I had cut all 150 blocks that resulted from one design repeat into circles because of my love for kaleidoscopes. I got a variety of sizes by cutting various width strips to be whacked through for each block. To see the bed quilt I made featuring those blocks go here. This top award winning quilt is created by Elsie M. Campbell of Dodge City, Kansas. She wrote for the show booklet, "I'm known as Aunt Mimi to my nieces and nephews. I love to garden, whether on my quilts or in my front yard. This quilt was my first bed sized, all machine made quilt. 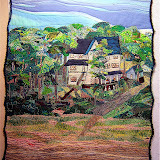 I loved watching it grow over the several months as I stitched away." This quilt was displayed in an area where the back side could be viewed as well. I've always loved being under a quilt and holding it up to the morning sunshine to see the pattern and colors from the under side. ... and one for Best of Show Wall Quilt. This amazing quilt is created by Nancy Prince of Orlando, Florida. She wrote for the show booklet, "Approximately 50,000 yards of thread and 5 million stitches created the thread painting designs. No embroidery cards were used. The background fabric was hand painted and Tsukineko inks were used to ink the doors and windows on the houses and bias-sided stores. My grandchildren are the merchants in the town. It took approximately 1500 hours of frustration, a ton of trial and error and incredible fun and ultimately total joy to complete the quilt. Take a look around the town and step back in history a bit." It also received the Surface Embellishment Award. I've saved the one I consider to be the best for last. It was awarded Viewer's Choice, so I'm not alone in my judgement. 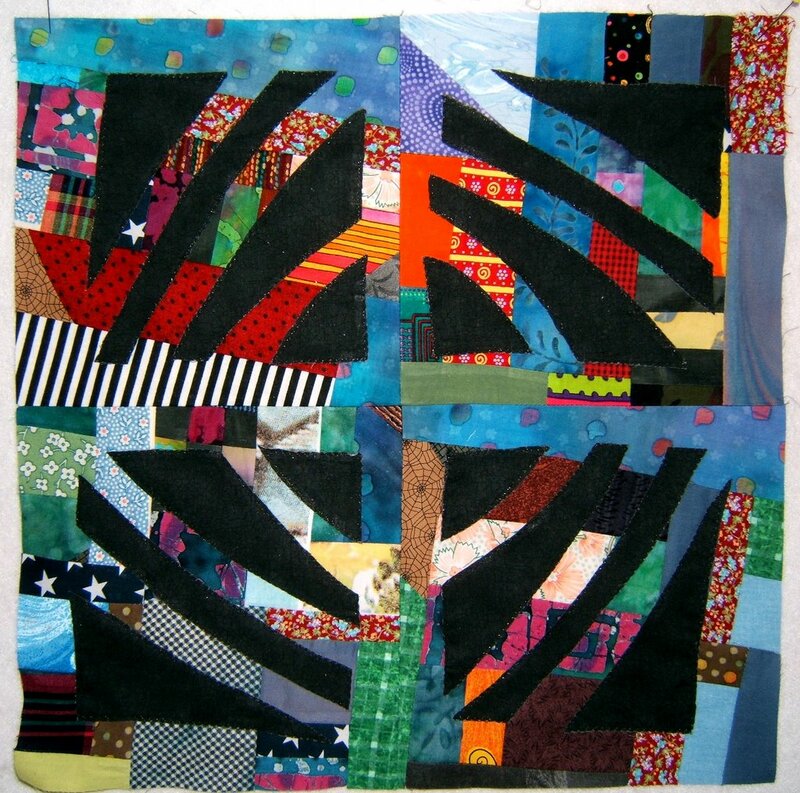 This fabulous quilt is created by Linda Roy of Knoxville, Tennessee. 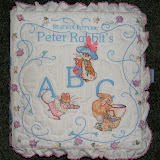 It is hand appliqued and then hand quilted. It also received the special award for Hand Workmanship. Linda says she based her design on old embroidered wool coverlets or quilts. 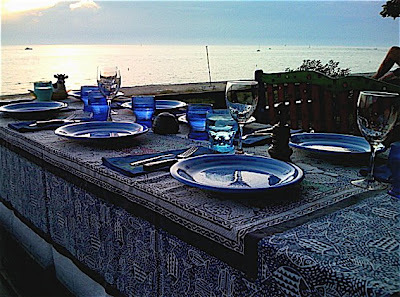 It all began with the rich chocolate Japanese background fabric and Amy Butler print fabric. 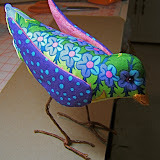 Post Note: Linda gave me what was left of that print fabric and I used it for this bird. The video screen on the TV's web page is on the right-hand side and you'll have to watch a commercial before each segment. OOPS, I just checked the links and they don't come up easily. You may have to go "digging" for them. As you've seen and read through my posts about the Smoky Mountain Quilt Guild show, it is much more than a venue for our members to share their quilts with the Knoxville community. It is open for quilts to be entered from all over the country and beyond. Consider entering your quilt in our show next year. You, too, may come away with an award ribbon and part of the $5000 cash prizes. At the very least you'll get a professional critique of your quilt and it will be seen and appreciated by 1200-1300 visitors to the show. 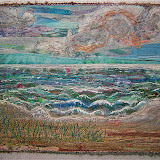 All of the quilts in this 2009 show can viewed in a slide show on the Smoky Mountain Quilt Guild website. 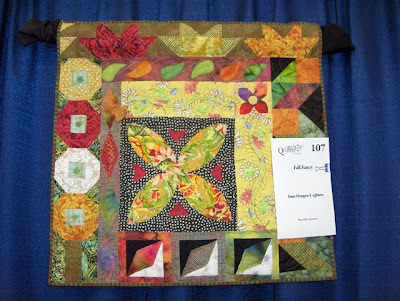 Links for slide shows of every quilt show dating back to 2005 are there, too. Another round-robin quilt from the international group. Two were featured in my previous post. This one belongs to Tone-Haugen-Cogburn of Maryville, Tennessee. She started it out with the large block in the center. Borders were added by Laila, Fran, Ada, and JC. 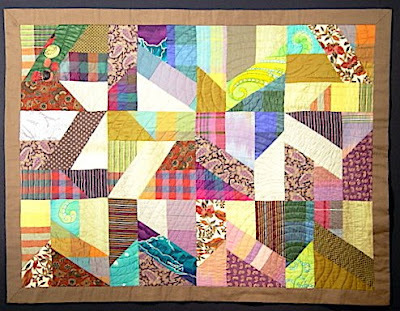 Elsie Vrendenburg of Tustin, Michigan was inspired to make this quilt after attending a Ricky Tims seminar, where he explanined how to design Rhapsody quilts. 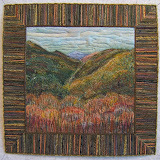 It was awarded 1st Place in Wall Quilts/Mixed Techniques. Another quilt created by Leona Harden of New Tazewell, Tennessee. She says, "This quilt became my cure for the winter blues and waiting for warmer weather and the return of my garden geckos." It was made for the 2009 Spring Celebration. It is Leona's original design and features hand-applique and longarm quilting. Audrey McCorkle of Knoxville, Tennessee made this quilt for her first grand-daughter. She chose the butterflies to symbolize new life, the flowers for beauty, and dragonflies for a sense of fun. It is an original design. Danette Gilbert of Knoxville, Tennessee tried to learn how to do "cathedral window" with a rose. She ended up making this quilt to honor her parents who were raised, married, and lived in Utah. The title of the quilt is the opening words for that state's song. It was awarded 3rd Place in the Appliqued Wall Quilts category. Cathy Henn of Heiskell, Tennessee was awarded 2nd Place in the Appliqued Wall Quilts category. The picture is of the Clinch River below Norris Dam ... "a place of peace and serenity." Donna Wiffen of Oak Ridge, Tennessee made this quilt using a Ruth McDowell pattern. 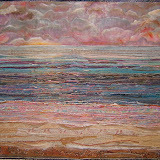 Another quilt made by Donna Wiffen awarded 2nd Place in Mixed Techniques Wall Quilts category. She says, "I love to do all kinds of handwork, so in making this quilt, I was able to combine both embroidery and quilting." She used a pattern by Dougal Ann Walker of the Freckles Collection. 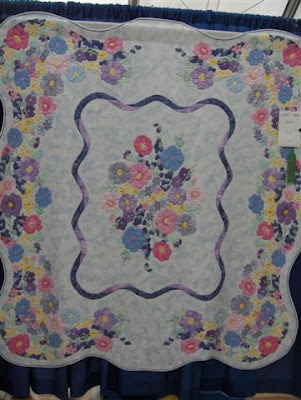 This quilt by Nancy Hahn of St. Peters, Missouri is made with her own unique use of "grandmother's flower garden" type blocks to form the pattern. She received an Honorable Mention. 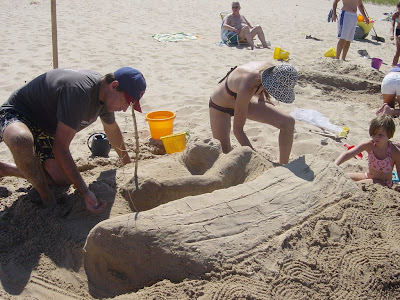 It all hand worked and took her about four years to complete. Maggie Casey of Knoxville, Tennessee used a more modern approach to a pattern that featured 30's prints. She was awarded an Honorable Mention for this quilt that was free-motion quilted on her Bernina. 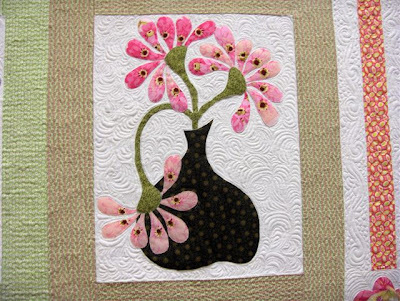 I love her choice of fabrics and this quilting is amazing. These last two quilts are created by Loretta Painter of Knoxville, Tennessee. Loretta's style of design has a unique signature ... they have an almost traditional look with a lot of punch, either from an unexpected color or choice of fabric in the mix. Loretta says, "This project was put together in record time. My original design was paper pieced in two weeks. It took a month to quilt it." 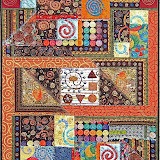 All of her quilting is done free-motion on a Jenome home sewing machine with a round hoop. There's alot of hooping and unhooping when she quilts. Loretta says of this quilt, "When I sat down with my graph paper to draw this quilt, I had two things in mind. I wanted to use a striped fabric and I wanted many stars. The 20 red stars are pieced and then hand appliqued onto the quilt top. The black outer border was machine appliqued on the quilt top. I used black cotton batting except under the white striped fabric ... there I used white batting." My next post will be the final one about this show.